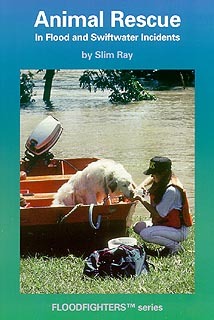 CFS Press announces the latest book by Slim Ray -- Animal Rescue in Flood and Swiftwater Incidents. This covers an often overlooked aspect of flood and swiftwater rescue; the rescue of non-human victims. To some people this will seem obvious, but if you are firefighter or other emergency services worker, it may not. "We got better things to do than rescue grandma's cat," if the often heard refrain. However, the public knows that firefighters do two things--put out fires and rescue cats from trees. So animal rescue is part of the job, at least in the public's mind, whether we like it or not.  Approximately 50% of all U.S. households have a pet of some kind.  Livestock losses in floods can often be measure in millions of dollars. While pet drownings are fairly rare, large numbers of cattle have perished in floods. "[F]looding killed several thousand dairy cows in the 1991 Snohomish Valley, Washington floods; 1200 dairy cows in Tilamook, Oregon, in 1996; and approximately 90,000 beef cows in the Dakotas and Minnesota in 1997." The ability of humans to communicate with animals varies widely. Animals can't understand verbal directions in human languages, except for perhaps a few simple words like "outside." Even human gestures that we interpret as friendly may be interpreted by an animal as threatening, especially during periods of stress. This leads to a basic rule of animal behavior: if an animal is threatened with harm, or what it perceives as harmful, it will defend itself as best it can. The weapons vary widely but the reaction can be swift, violent, and occasionally deadly. In short--you can get hurt if you're not careful. It follows, then, that the best way to deal with an animal is to convince it that you mean it no harm. This may be difficult if the animal is already in a life-threatening situation, such as in a flood. Since logical discourse with an animal is not an option (unless perhaps you have Dr. Doolittle along), you can deal with them by either physically restraining them or by convincing them to do what you want them to. For large, heavy, powerful animals like horses the preferred method is to get them to cooperate. For small, skittish animals like cats, restraint is the best option. As a rescuer, you need to understand enough about the animal's instincts, physical characteristics, and psychological makeup to make an intelligent decision about what your options are. Animal behavior is driven far more by instinct that is that of humans. In disasters animals follow their instincts more than what we would consider reason. Like humans, they may panic and exhibit non-purposeful behavior. For the rescuer, it is important to know how different animals react. Sometimes, animals are not aware that they need to be rescued. Dogs, for example, will often continue to defend their territory against rescuers. Domestic animals act differently when their owners are not around. Most animals will retreat from danger; however, when the "attacker" moves within a certain critical distance, they will launch a pre-emptive attack. Remember: a stranded animal often cannot retreat!